Mexico City’s population is estimated to be more than 20 million—and continues to grow rapidly. The city has more than 5.5 million vehicles, one of highest concentrations of cars in the world, and that number may double over the next years. 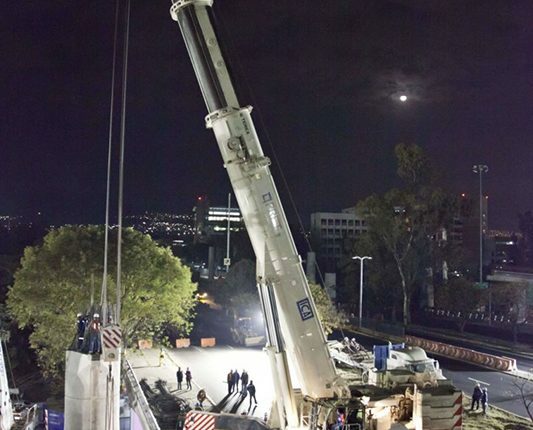 Ingenieros Civiles Asociados SA (ICA) is using Terex all-terrain cranes on a major highway project to help accomodate the city’s transportation infrastructure and cope with the city’s increasing population. The plan is to construct a major new elevated road to the south of the city. The first section is the 11.3km long Autopista Urbana Sur (Urban Highway South) being built by Mexican contractor ICA Ingenieria at a cost of about US$450 million. The highway has been designed to alleviate the congestion to the south side of the city, cutting journey times by half. This new road features two lanes in each direction and includes some stretches of six lane carriageway. The road connects San Geronimo to Tlalpan Viaduct at the second deck level of the city’s existing elevated peripheral highway. Given the tight space considerations and tricky logistics, the road is being built using prefabricated concrete sections made about 40km away from the construction area and erected during the night. The prefabricated concrete production facility had 22 hectares, 15 fabrication tables, and 120 molds. With an industrialized process and a workforce of more than 2, 000 workers, it was able to deliver all pieces on time to be transported and mounted each evening. Approximately 18,000 prefabricated elements were utilized for this project, which were installed between 11 pm and 5 am, the only time the vehicular transit was interrupted. This is the first time in Mexico that this construction method has been used to build a complete overhead highway, and it is also the largest urban project of its kind so far. ICA specializes in large infrastructure, heavy construction and civil engineering projects. As well as employing 40,000 employees, the company also owns 12 Terex cranes, including several 500-tonne capacity class AC 500-2 all-terrain cranes, which are being used for erecting the main concrete columns, beams and components. Larger components are lifted using tandem lifts. The time taken for the Terex AC 500-2 to drive from the depot to the jobsite was about 30 minutes, and another hour was needed before it was fully rigged and ready to lift. Between four and five people were involved in the rigging process and just two additional low loader ballast wagons were needed. Some column sections weighed up to 425 tonnes while the 36 to 48 meter long and 4 to 6.5 meter wide (depending on the number of lanes they carry) horizontal sections weighed up to 350 tonnes. In total there are about 20,000 pre-cast components made from high strength concrete including about 500 columns varying in height from five to 25 meters. Sections were prefabricated at a pre-casting facility using a process that took just 48 hours. Once cured the units are transported and placed in to position on-site. Super-efficient logistics are critical to enable the construction to keep to the 14-month schedule with three to four massive sections being installed each night. Because of the size of the main elements, they are erected one at a time although smaller elements can be erected simultaneously. The support columns feature an integrated shoe and head design. This makes the erection process much quicker although precise positioning of the columns is needed to locate each unit into deep foundations prepared in advance.